Do you feel sometimes that 24 hours is just not enough for all the things that need our attention? We barely have time to meet deadlines, long queues at the supermarket, excruciating commute from home to work and vice versa? How many times have we missed holiday get together with our college buddies, close friends and failed to attend family gatherings? When was the last time you had that day to yourself? When you just spent it walking around the mall, gave yourself that much deserved haircut and foot spa or maybe just a quick cheat day at your favorite fast food. It's been a while I guess and certainly, we need to make up for lost times without coffee. I have tried several energy boosters in the market but nothing compares to Robust Energy! Robust Energy Capsule contains the ENERBOOST formula which is made up of ingredients with main benefits that give extra energy needed to cope with everyday living of different individuals with various lifestyles. The ENERBOOST formula contains properties which help boost energy, enhance endurance, improve alertness and alleviate stress without caffeine. This gives you energy boost without the “crashing effect” of caffeine namely palpitations, anxiety and lack of focus. Like RobustEnergy on Facebook to get more promos and updates. 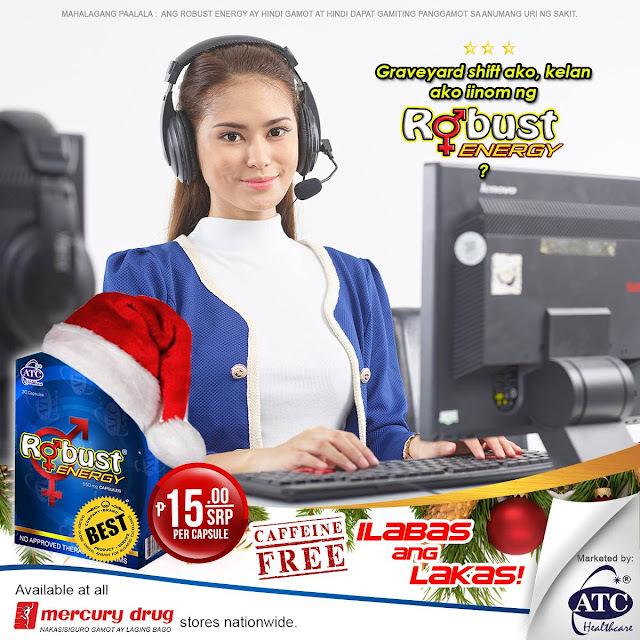 Also, please follow @RobustEnergyPH on Instagram and Twitter.